o To open the tail gate, unlock it by turning the key clockwise, then pull the outside handle toward you. o To close, lower the tail gate and shut firmly to engage the latch. Lock the tail gate by turning the key counterclockwise. o If the vehicle is equipped with central door locking, the tail gate can be locked without a key. 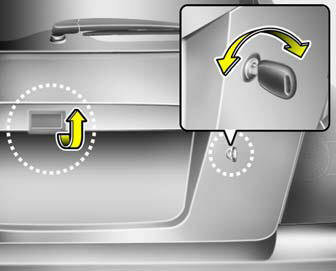 Push the front portion of the central door locking switch after closing the tail gate. o If the tail gate is open when the front portion of the central door locking switch is pushed, the tail gate will be locked when it is fully closed.